Oh for the love of back to school shopping... I always wanted to have the shopping part without the going back to homework and tests part... a girl can dream, huh? I might not be a "traditional" student anymore, but that doesn't stop me from a little back to school shopping or first-day-of-school outfit picking outing! I guess I won't be riding my bike to work in this body con skirt, but I love that this look is head to to jersey knit... comfortable and chic! What would you wear for your back to school fashion statement? Any other still-in-school adults like me? Love this look! I think you describe it perfectly as comfortable and chic! I love this!! It’s a classic look - so pretty! Aw, back to school shopping. Takes me back. Why is it just splurging when adult do it?! LOOOOOOVE the peplum. I haven't tried it with a pencil skirt but def will now. You look so sophisticated in that peplum top! No more school for me but I'm happy to do back to school shopping hehe. Have a great weekend, Jessica! 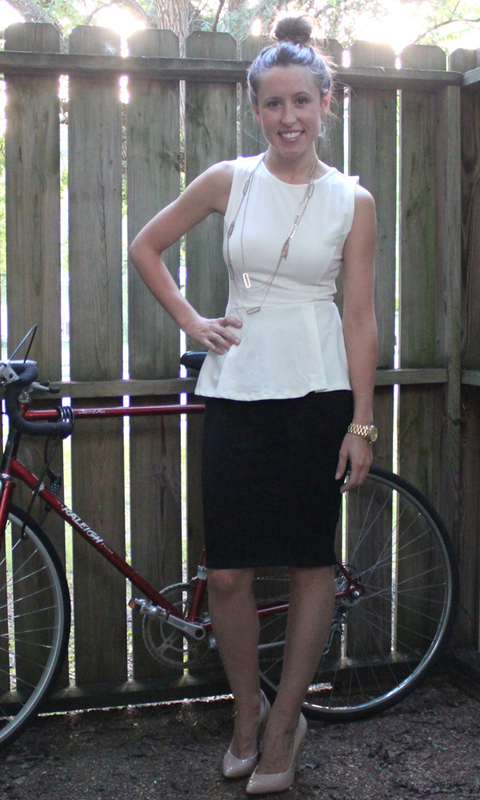 I am obsessed with both peplum and pencil skirts, so you know I love this look! So cute! The black and white combo is so classic. I'm going to have to look into the jersey knit skirt, sounds so comfy! I like back to school shopping too! :) I love your necklace!! I love peplums with pencil skirt! You look great! your peplum top is adorable on you! i never realized that vogue's largest issue in in september, ever! Adorable!! Love the peplum on you! I love the simplicity of this look! 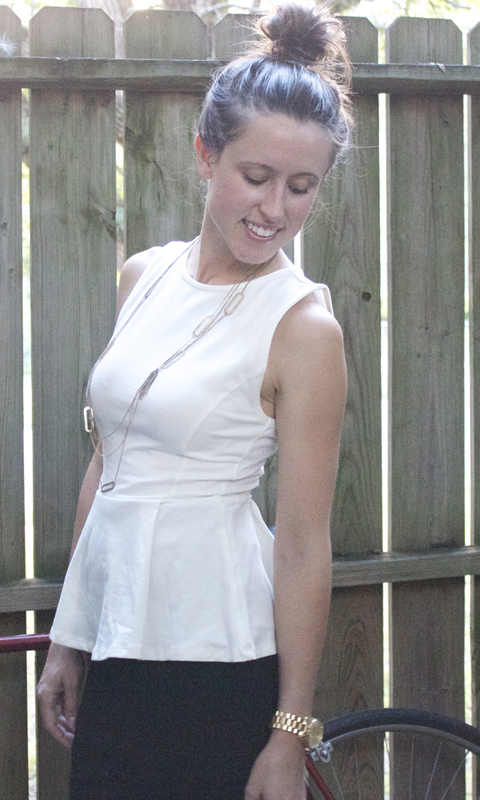 So classic but still fun with the peplum. Back to school shopping is always a wonderful thing. I love this classic black and white combo. 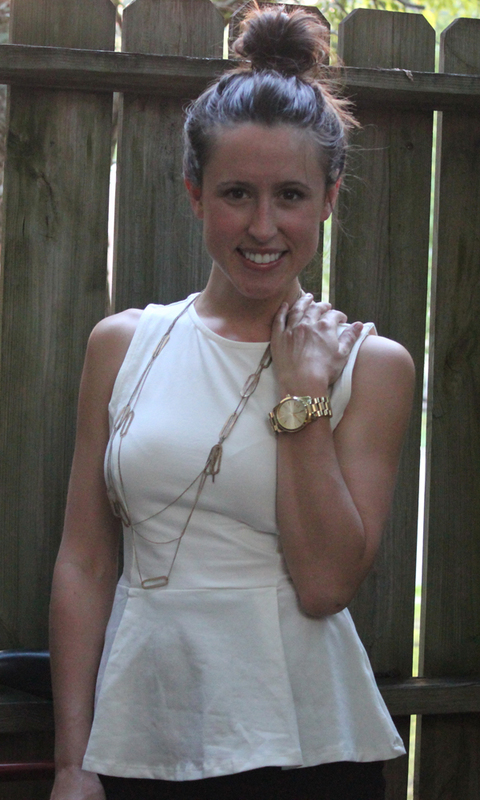 And the peplum top is super flattering - one of my favorite new trends. Hope you have a wonderful weekend, Jessica! Love you in this elegant outfit. And you know how much I love back-to-school fashion and attitudes. One of my favorite parts of being a teacher! I just wanted to tell you that your hair is so cute like this - you have the perfect head for a topknot! Just found your blog and I love it, great style! I wanted white peplum for the summer and now of course I want black leather peplum (or burgundy) for the Fall. <3 the outfit. can you tell me what size peplum top you ordered? i think we're the same size but didn't know whether to get the 2 or 4. thanks! I got it in a size 6... Made of stretchy material. That peplum top is just gorgeous! great oufit - very professional chic!